Hope for Migori is a non-profit organization that exists to see that the physical needs of orphans in Migori, Kenya are provided for. Through the monthly support of sponsors Hope for Migori is able to ensure that caregivers in Migori have the means to provide for the orphan(s) in their care. 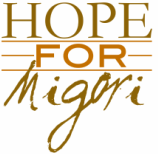 We hope that you would consider sponsoring a child through Hope for Migori. Sponsorship costs $25/month or $300 annually.